Brady v. Urbas, a case from the Pennsylvania Supreme Court, involved plaintiff who suffered from long-term foot problems. Her foot issues were due to toe deformities. Plaintiff had been going to the same podiatrist for years, and he was successfully able to perform surgical procedures to treat the problems with her left foot. At this point, he continued to treat the deformed toes on her right foot. 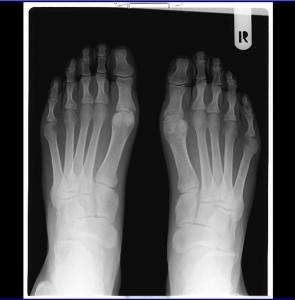 Plaintiff’s primary problem on her right foot was a medical condition known by doctors and patients as hammertoe. Hammertoe in her second toe caused her middle toe to rise, so it was sitting above the natural plane of the sole of her foot. This made it extremely painful when wearing shoes. Plaintiff’s podiatrist decided four surgical procedures would be necessary to correct problems with plaintiff’s right foot in regard to the hammertoe condition. Prior to each surgical procedure performed over the course of a year and half, podiatrist provided plaintiff with a consent form purportedly listing all the risks associated with the proposed surgical procedure. Plaintiff signed a consent form prior to having each surgical procedure. This form, known as an informed consent form, required plaintiff to acknowledge she was aware of the risks. When the first surgery did not fully fix plaintiff’s painful condition, he performed three additional surgical procedures. All four surgeries involved removing bone structure with a belief soft tissue would grow and fill in the space where the bone material used to be. When all four surgeries were complete, plaintiff still had pain and a general lack of stability in her foot. She went to a different podiatrist at this point, and he felt a bone graft was needed to improve plaintiff’s condition. He performed the surgery, and her toe was restored to nearly the condition it had been before the operations. A good deal of her pain was alleviated, and her stability was largely increased, but her foot was far from perfect. Plaintiff eventually filed a negligence action against her first podiatrist, alleging he had performed procedures that were not medically necessary, and he did not consider the underlying cause of her foot condition. As the appellate court noted, her complaint, interestingly, did not include claims for lack of informed consent. At trial, plaintiff move to exclude admission of the informed consent forms, arguing they were not relevant. Defendant opposed this motion, arguing they were very relevant to the issues at hand. Trial judge denied this motion, and the jury was allowed to hear this evidence. The jury returned a verdict in favor of the defense, and plaintiff appealed. On appeal, the court ultimately reversed trial court on grounds that, in a medical malpractice case, the issue of informed consent in generally not relevant. As our Boston medical malpractice attorneys can explain, unless there is a claim of lack of informed consent, the issue is whether the doctor performed the appropriate procedure according the national standard of care, not whether plaintiff was aware of the risks. If there was a better procedure that did not involve those risks, plaintiff would have no way of knowing, because of reliance upon doctor’s expertise.